For Week Three of National Preparedness Month, the topic is “Check Your Coverage”. When it comes to any emergency, including fire-related emergencies, insurance can be a huge help when restoring your home or business after disaster. There are certain things to consider when choosing your insurance, and guidelines that must be followed in order to retain proper coverage and receive help when needed. 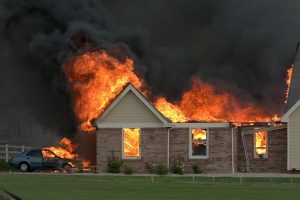 As one insurance company explains, most homeowners insurance policies cover the costs of repairing your house and/or other structure on your property if it is destroyed by fire. Some policies also reimburse you for a certain amount of lost belongings within the structure, such as furniture or appliances. In severe cases, your provider may help pay the cost of living if your family is forced to live outside of the home for a time. If you have more valuable belongings or greater reason to fear fire-related emergencies, you may want to consider purchasing additional coverage, or paying for a higher limit on personal property. You also want to make sure you consider the fluctuating price of materials and evolving real estate market when setting the limits for your dwelling, or the rebuilding of your home. Changes in the economy could cause your house to become more expensive to rebuild than it was originally. When speaking to your insurance provider about coverage for your home, be sure to explain the types of items you have, their value, and how much you hope to be reimbursed in the event of a house fire. Home Insurance.org reminds you that you will need liability coverage to help with any injuries sustained during the emergency. You will not receive coverage in cases of arson, when the fire is started intentionally. You will also need to request special coverage if you own a vacant home, as a house unoccupied for more than 30 days is not covered under standard insurance. When choosing insurance to protect your business, it is important to consider a few different types of policies and coverage. Property insurance will work much like the homeowners insurance policies listed above: it will help cover the costs of rebuilding damage done to your storefront or physical business location. However, the Insurance Information Institute also recommends business owners invest in business interruption insurance. Business Interruption insurance policies help you recover from the money lost during the days after an emergency, when your company is losing revenue due to being inoperable. Different versions of a these policies will also offset the costs of fixed expenses, like rent or basic utilities, and even help pay for the location where your business moves and operates temporarily during the recovery. These policies are offered as add-on options to some types of business and property insurance, so if this is something you would like to invest in, you will want to do some research and potentially change coverage options if your current plan does not offer this addition. As with homeowners insurance, proper liability coverage will also need to be in place to protect the business owner in the event that his employees are hurt during the fire-related emergency. Checking your coverage before disaster strikes is the best way to guarantee you will receive assistance when rebuilding your home or business after a fire-related emergency. As always, following the NFPA suggestions and code regulations to put the proper fire protection equipment in place can stop the emergency before it occurs. While looking into your current insurance coverage, it would be a good idea to double-check your fire preparedness, as proper protection is truly the best way to protect yourself before the problem occurs. September is National Preparedness Month, and this year we will be observing it with a series of articles on fire safety for your home and business. Every Friday we will address how to apply Ready.gov’s weekly theme to fire-related emergencies. We will also post several other articles throughout the month addressing specific fire and life safety concerns. Drop us a comment on Facebook, Twitter, or LinkedIn if there is a preparedness topic you would like us to cover!